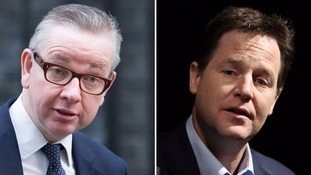 Nick Clegg has mocked former education secretary Michael Gove over his "absurd" behaviour as he condemned Conservative plans for England's schools. The Liberal Democrat leader claimed Gove personally drew up lists of medieval monarchs he believed children should learn about in school history classes. He also warned that the Tories' "irrational" commitment to free schools could starve council-run schools of funding. Clegg, who revealed frustration over the "fruitless and fruit-cakey policy spasms" during the coalition's time in office, said he would stop free schools opening in areas where there is no shortage of places. I remember when I thought 'This is just getting absurd' was when someone explained to me that Michael Gove was personally handwriting lists of which medieval kings British schoolchildren should learn, according to his personal recollection of which kings and queens are important. I just thought, 'This is something out of The Thick Of It'. You have the secretary of state personally instructing the hapless children of this country which medieval kings you want them to learn by rote. I'm afraid this happens in government, I've seen this, where a secretary of state, it all slightly goes to their head, they think it's their personal fiefdom or their personal gift. Talking about his own party's education policy, Clegg said, "Something has to give, and I will tell you what will give - what will give will be lots and lots of local schools up and down the country that need to be supported, not undermined."